When I book a plane ticket, I fly economy, but I always cast an eye over the prices in the business class column. For three to four times the cost, I could get better food, more room, a more comfortable seat and more personal attention. What I wouldn't get is a faster trip. So although I'll pay a few extra bucks for a little extra legroom in coach, I forego business class, because the luxuries aren't worth all the added money. To an increasing extent, smartphone buyers are being asked to make similar calculations. As high-end phones reach the $800 mark (rumors have it that the next iPhone will have a shocking $1,000 price), name-brand vendors are carving out economy-class price niches at about a quarter of that. And in the same way that the less expensive airplane ride will still get you to Fargo or Paris, the cheaper phone will give you what you want just as safely and almost as quickly. The latest economy-class phone is the Moto G5 Plus. It's built with the same style language of the Moto Z: aluminum body, slightly rounded back and a distinctive .87-in. circular, .08-in.-high bump on the phone's back for the camera. It's immediately recognizable as a Lenovo-owned Moto phone (as opposed to the design of the Google version of Moto, or that of the original independent company). Unlike the Moto Z, there are no contacts on the back for expansion modules; the G5 Plus rides alone. The phone feels sturdy and is pleasant to hold. At 5.9 x 2.9 x 0.3 in., the G5 Plus is among the smaller contemporary phones, roughly the same size as the Huawei Honor 6X, with which it competes. Moto's engineers did not strain themselves to shoehorn a particularly big display into that space -- its 5.2-in. LCD screen with a 1080 x 1920 resolution is smaller than the Honor's 5.5-in. screen, although both phones have the same pixel count. Power and volume buttons are along the right edge, the drawer for dual SIMs and a microSD card are along the top, and the headphone and micro-USB ports are on the bottom. The single-port speaker fires through the same aperture used for listening to phone calls. It's nothing to write home about. There's a fingerprint sensor on the phone's chin, below the phone's Back/Home/Recent soft buttons. There is no provision for left-handedness. The phone runs a stock version of Android 7.0 (Nougat). 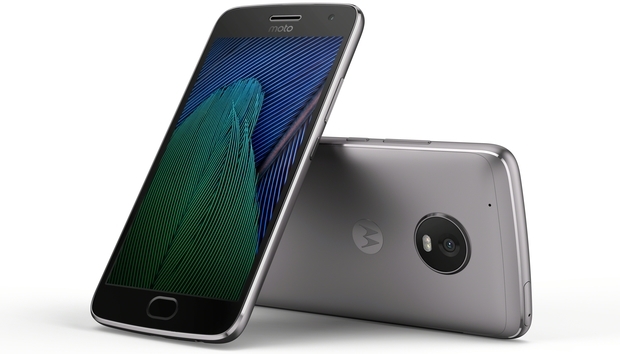 The Moto uses an eight-core Snapdragon 625 chipset, and comes with either 2GB memory and 32GB storage or 4GB/64GB. (I reviewed the latter.) Performance was on the low end of so-so, scoring around 64328 on the Antutu benchmarking suite. That's below the top 50 currently available phones, but a bit ahead of the Honor 6X's score of 57055. I noticed that, particularly in the 3D graphics part of the test, the G5 Plus' display looked choppy. This is not a phone made for heavy-duty gaming. On the other hand, the 3,000mAh battery is quite substantial. I wasn't able to complete a full-drain battery test -- the G5 Plus' system software seemed to short-circuit it -- but the partial tests that I was able to complete indicated that the battery would last a full day and then some under a steady load. That makes sense: It's a big battery running a small-ish screen and a mid-spec chipset. Other corners also get cut. Wi-Fi is 802.11n, but not ac. The phone uses micro USB, not USB-C. GPS does not include support for the latest Galileo European network. In the United States, there is no NFC chip. The camera is a little better than okay. The main back-facing camera shoots up to 12MP at f/1.7 (wider than most) in 4:3 format and 9.1MP in 16:9. Videos can scale up to 4K at 30fps or 1080p at 60fps. Lenovo says the camera uses more than the usual number of pixels to focus, letting it focus more quickly than competitors. The front-facing camera has 5MP at f/2.2. There's no autoshooting, smile detection or similar features, although the camera does have slow-mo and panorama modes. A "professional" mode allows somewhat more manual control than pure automatic mode. If you're looking for a serious smartphone camera, there are better. But lest you get the idea that the G5 Plus is all narrow seats and no legroom, there are a bunch of very nice touches in this phone to make the ride more comfortable. The fingerprint sensor hides some neat tricks. If you enable one-button navigation, swiping left on the sensor is the same as tapping the Back button, and swiping right is the same as tapping the Recent button. Tapping the sensor brings you home, and holding it launches Google Assistant. In all cases, touching the fingerprint sensor both unlocks the phone and puts it to sleep. It's easy to get the hang of the kind of tap that brings you Home and the kind that sleeps the phone. Other gestures with the phone itself can turn on the flashlight (a double chopping motion) or launch the camera (a repeated wrist twist). Sometimes they work, although I wouldn't want to bet my rent money on their working reliably. And there are a lot of subtle geek things that start to add up. Most phones that have dual SIM support will either support two SIMs or one SIM and one microSD card. The G5 Plus lets you do both. That makes the SIM drawer a little complicated, but travelers will appreciate it. There is no -- zero -- bloatware, other than a couple of Moto apps that let you control special features of the phone. Otherwise, this is as close to a native Android experience as you're going to get. The only applications that this phone comes with are those in the native Google app stack: Google, Mail, Maps, YouTube, Drive, Play Music, Play Movies, Calendar, Play Store, Duo, Contacts, Chrome, Messages. And there's FM radio, which has been part of smartphone silicon forever but which vendors are only now activating. Oh -- there's a genuinely helpful Device Help app, too. Another truly remarkable but non-obvious thing about the G5 Plus: Wherever you buy it, it is unlocked and will work on any of the four U.S. networks. It has radios for GSM and CDMA, so will work on AT&T, T-Mobile, Verizon or Sprint. And it will work overseas, too. Being unlocked, unbloated and carrier-agnostic, it is perhaps unsurprising that the G5 Plus will be available on March 31st pretty much everywhere except from a carrier. (Pre-orders start today.) Moto says you'll be able to buy it at Amazon, Best Buy, B&H, Newegg, Republic Wireless, Target, Costco, Ting and Walmart. Which brings us, perhaps, to the biggest feature of all: the price. The 2GB/32GB version will sell for $229; the 4GB/64GB version will cost $299. The lower-end phone roughly competes with the Huawei Honor 6X, which sells for $250. But if you're an Amazon Prime member, you can get the Moto 5G Plus for $185 for the 2GB/32GB version or $240 for the 4GB/64GB under its Prime Exclusive program (as long as you don’t mind lockscreen ads). I'm pretty sure that Moto is the first name-brand vendor to break the $200 barrier. So here's your choice: An iPhone 7 Plus costs $769 and a Samsung Galaxy S7 costs $570 (although the S8 is due any day now). For that money, you could get two or three Moto G5 Pluses. They all take phone calls, they all run apps, they all take photos. The iPhones and Galaxys are undoubtedly plusher and faster (though you could make a good argument that the lack of bloat on the Moto G5 makes it a better deal than the Galaxy S7). But, just as on an airplane, the economy seat gets you there at pretty much the same time as the business-class seat. From an industry standpoint, the G5 Plus is significant because it's a smart reaction to an alarming trend in the phone business: rising used phone sales. At the end of 2015, Deloitte predicted that about 120 million used smartphones would change hands at an average of $140 per device. If you made smartphones, wouldn't you rather capture that money with a yesterday's-spec phone rather than let your old phones cannibalize your sales? A new sub-$200 phone might compete powerfully with a two-year-old model for $140 -- and the Moto G5 Plus is a prime candidate to do just exactly that. If you're on a tight budget, or if you just plain like the idea of getting two or three phones for the price of one, check out the Moto G5 Plus.